Home Blog I’m All About That Base—It’s Portable! I’m All About That Base—It’s Portable! 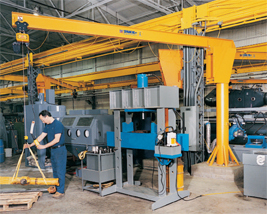 Is your jib crane easily assembled to reduce cost? If you’re considering a freestanding jib crane in—or outside—or your facility, there are a variety of options to consider depending on the needs of your operation. For instance, the install location will dictate the type of crane you select to ensure proper installation. Foundation-mounted freestanding jib cranes are an excellent option for most operations, but for some companies, they’re just not practical. In some instances, freestanding jibs require reinforced concrete foundations that cost more than the crane itself. If you’re interested in purchasing a freestanding jib but concerned about cost and flexibility, portable bases are for you. Portable base plates serve a very unique purpose in the manufacturing industry and other industrial sectors where flexibility and portability are extremely important. Some companies may need to purchase and install a freestanding jib crane for a specific short-term application. Foundation-mounting is a great solution for the right operation, but for those companies looking to use their jib crane in multiple operations over the span of several years or more, a portable base plate is very effective. 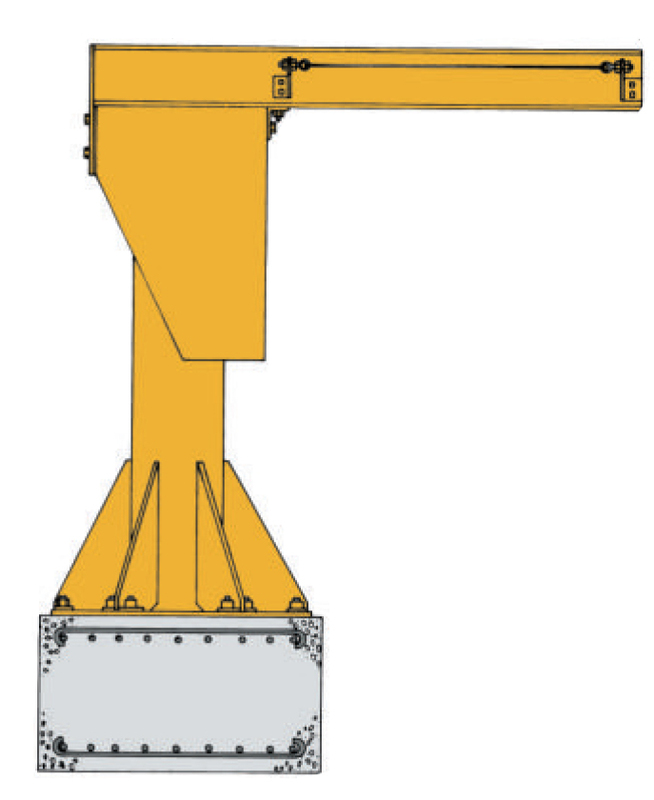 All freestanding (also known as Stand-Alone) jibs cranes provide full 360-degree rotation, and offer higher capacities, longer spans, and greater rotation than wall-mounted jibs. What makes base plate mounted jib cranes so useful is—as their name suggests—their portability. Additionally, base plate mounted jib cranes are the easiest to install, because there’s no need to dig and pour concrete. Portable base plate jibs can be transferred from indoors to outdoors—particularly if they’ve been treated for outdoor applications using special paint finishes to prevent corrosion. Assembling and installing base plate mounted jib cranes is easy because the base plate is simply secured with anchor bolts to your foundation. The mast is connected to a square or hexagonal base plate (depending on the jib size), and reinforced with six equally-spaced knee braces to ensure safe and cost-effective installation. For all of our freestanding jibs, the pipe mast or column is designed to give maximum strength and minimum deflection—to resist bending, buckling, and crushing, and to prevent wear by the trunnion roller assembly. But, with a base plate mount, the entire jib—base and all—can be disassembled, transported, and installed at practically any location.